In 2008/2009 the Rural Industries Research and Development Corporation (RIRDC) commissioned Prof. Robert Spooner-Hart of the University of Western Sydney (UWS), following representations from Jean-Pierre Mercader, to investigate and evaluate the benefits of using tube bottom boards at the UWS site was from November 2008 to February 2009. 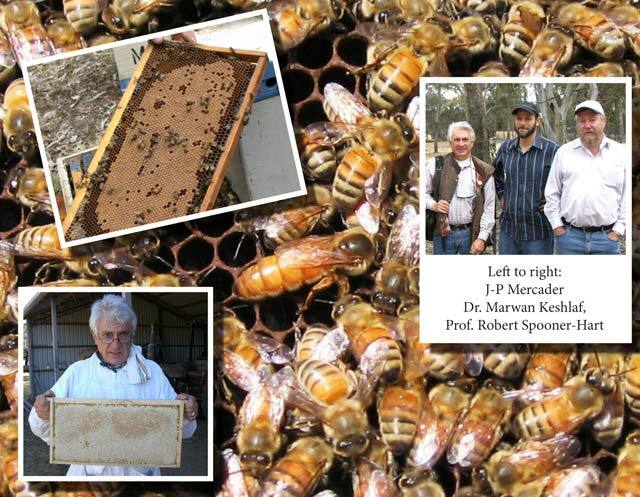 In the absence of the Varroa Destructor in Australia, the project aimed to determine whether any different bottom boards could assist in reducing populations of the small hive beetles in the beehives. It was considered that an improved bottom board may allow the honey bees to live with the Varroa Destructor since honey bees readily groomed themselves to keep their bodies clean at all times. The traditional / plain bottom board in conjunction with the traditional brood box create the right environment for the SHB to establish themselves and proliferate successfully with the dreadful result of the loss of the honeybees colonies if nothing is done. We can firmly say that the above mentioned facts will also apply for the Varroa Destructor. No one can challenge the assumption that the Australian honeybees will be susceptible to Varroa Destructor. We are aware since Varroa struck the Mellifera bee-colonies that their survival to Varroa very much depends on an individual bee’s cleanness, each hive’s cleanness, each bee colony’s strength and health and to the assumption of a degree of a natural resistance to Varroa. We know that the traditional / plain bottom board creates the perfect brood box environment for both the SHB and Varroa to proliferate. However, we observed and now know that the honeybees hives’ environment created by the traditional / plain bottom boards is FOREVER CHANGED when the Bluebees Board REPLACES the old traditional / plain bottom boards, together with a new entrance cut to the bottom edge of the brood boxes. We know that the Bluebees Board boards definitely assist honeybees colonies to effectively and efficiently control the SHB population in honeybees hives. These colonies remain healthy, strong and productive. The Bluebees Boards allow the right means for the honeybee colonies to create and maintain the highest level of cleanliness to both themselves and their hives. The honeybees colonies, being stronger and healthier, will consequently reach a higher degree of natural resistance to pest invasion and diseases. The following graphs show results of the comparison of two bottom boards. Shows the mean number of out-going bees per minute, per colony in hives with different bottom boards. 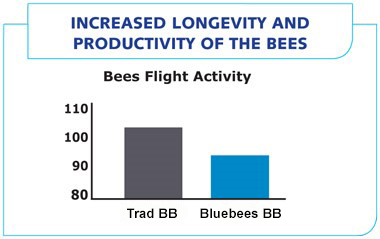 Lower flight activity and greater productivity indicated a better efficiency with hives fitted with the Bluebees Board, possibly increasing the bee’s longevity. Shows the mean area of stored pollen, in cm², in hives with different bottom boards. 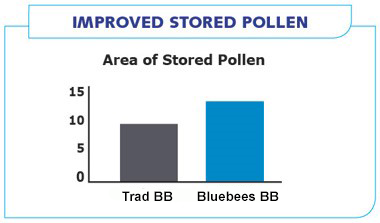 The area of stored pollen for hives fitted with the Bluebees Board is up to 30% larger than hives fitted with the hives fitted with plain bottom boards. Shows the mean area of sealed brood in hives fitted with different bottom boards. 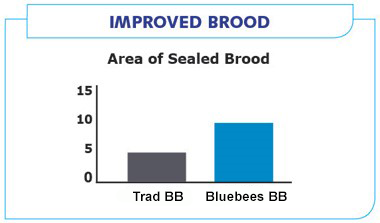 The area of sealed brood for hives fitted with the Bluebees Board is up to 17% larger than hives fitted with plain bottom boards. Shows the mean weight of honey (in kg) produced in hives with different bottom boards. 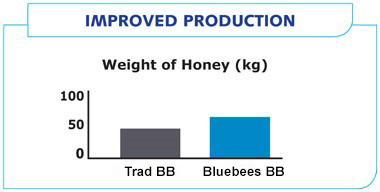 The weight of honey produced by hives fitted with the Bluebees Board is up to 30% more than the hives with plain bottom boards. Shows the mean number of SHB per colony for hives fitted with different bottom boards. 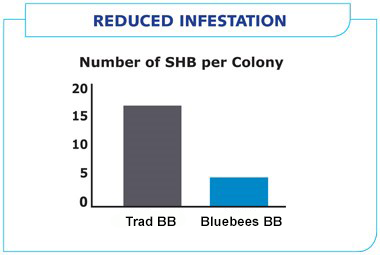 The population of SHB in hives fitted with the Bluebees Board shows at least a 67% reduction in the population of SHB when compared to hives with plain bottom boards. The introduction of the Bluebees Board in the brood box demonstrates the ability of the honey bee colonies to effectively control pest population when the hive, as fitted with the Bluebees bottom board, allows it. The honey bee colonies have now – at last – the means to live with pests while remaining healthy and productive. From the graphs shown above, one can conclude that the hives fitted with the Bluebees Board are showing better results. Furthermore, hives fitted with plain/traditional bottom boards show substantial amassed quantities of debris, where the SHB hide and diseases incubate more readily. It is obvious that the Varroa Destructor has found a perfect home in the plain/traditional bottom board habitat from the experience of Europe, Nth America and other countries. Though the Varroa Destructor has not yet arrived on Australian shores, the design of the Bluebees Board will make it difficult for the Varroa Destructor to establish itself. The honey bees, through their grooming, will discard the parasites, which will then be ejected from the hive due to the design of the Bluebees Board. It is understood that the Varroa Destructor cannot survive outside the beehive or without a host bee or larvae. Once they are ejected from the hive they will die. The Australian Beekeeping Industry must be well prepared for the advent of the Varroa Destructor’s arrival and to control the already present SHB. The simple solution to manage infestation is to install the Bluebees Board. It is a low cost for a minimum impact advancement in Brood Box construction. The installation of the Bluebees Board will secure the overall productivity of the honey bee hive with financial benefit to beekeepers. It will reduce the level of human intervention and the use of chemical management. The Bluebees Board is the right brood box bottom board because it enables honey bee colonies to self-manage interloping pests, the cleanliness, dryness and the overall healthiness of the hive environment.